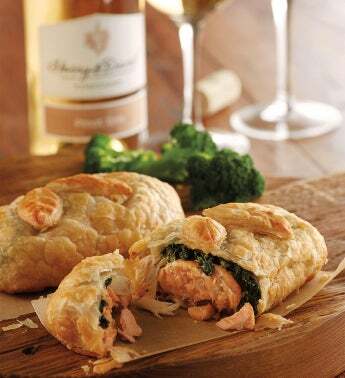 A twist on classic Beef Wellington, this dish features firm Atlantic Salmon and a blend of herbs, spices, pesto, cheese, spinach, and crab meat tucked inside a flaky puff pastry shell. So elegant and so simple to serve. Simply bake until deliciously fragrant and golden brown. This incredible entrée arrives accompanied by a bottle of Harry & David™ Pinot Gris.